How Much Does Security Bar Installation Cost? You may want to spare the cost, but if you live in a neighborhood that has a high crime rate, security bar installation might be the smart choice. Not only will you get an increased peace of mind knowing you are fortified inside your home, you can actually oftentimes receive a discount on your homeowner insurance policy. Home security bars come in a number of popular materials, each with their own precise costs and advantages. Wrought iron: This is a traditional material choice. It's not as affordable as aluminum, but it is durable and attractive matching many classic home designs. Aluminum: Fast becoming the standard choice, aluminum bars are cost-effective and go up easy. Steel: Still pretty affordable, steel bars are a bit more costly than aluminum, but provide superior strength. If your security bars aren't treated, they can become prone to rust depending on your climate. Transparent bar: The transparent bar material choice is new and still pretty expensive. Sometimes, depending on where you live, the choice might not even be an option due to local suppliers not carrying it yet. This is the same material used to make motorcycle helmet visors and riot gear shields, so you know it can take a beating. How Much Will It Cost To Install Security Bars? Some neighborhoods make security bar installation more or less a no-brainer. The cost to install security bars, spread over a number of years is rather small compared to the cost of replacing items that could be stolen in one single burglary. 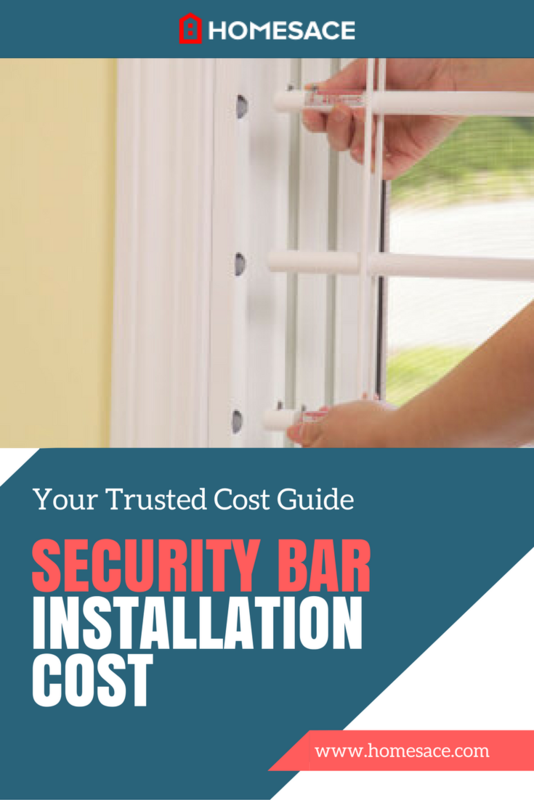 Homeowners should expect to spend anywhere between $500 and $2000 for the entire security bar installation job, with $900 being the cost of an average job. Speaking to a knowledgeable contractor is essential. Sometimes, it's only advisable to protect the ground-floor entryways, and in other cases, you get additional savings the more windows and doors you choose to cover. When the installation team visits your home, you'll have a number of topics to discuss. After you have gathered some quotes to find out the cost to install your security bars will be for you, you'll want to contact your insurance company to see if you'd be eligible for an additional discount. How Can I Get A Free Quote From Local Specialists? Security bar installation certainly isn't required for every home, but it may be an actual lifesaver in some situations. You know better than anyone else whether it makes sense given the neighborhood in which you live and the value of your belongings inside your home. If you would like to get in touch with some local professionals to get a more accurate breakdown of the cost to install your security bars, simply enter your zip code in the space provided on this page. Remember, this offer is 100% FREE with absolutely no contracts and no hidden costs. Security bar installation experts in your area will be more than willing to provide you with a no-obligation estimate and discuss your options.